Large, fragrant, white blossoms are just the beginning of the appeal of a magnolia tree. These attractive trees also feature glossy, dark green leaves and a large, exotic-looking pod that opens in fall to reveal bright orange-red berries which are relished by birds and other wildlife. 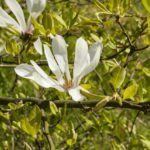 Learning more about magnolia planting and care is a great way to enjoy these trees in your landscape. Magnolia trees are native to East Asia and the Himalayas, eastern North America and Central America. They grow 40 to 80 feet tall with a spread of 30 to 40 feet. Depending upon the species, magnolias may be evergreen, semi-evergreen or deciduous. Some of the deciduous types bloom in early spring before the tree leafs out. One of the difficulties of magnolia tree care is managing the large, crispy leaves that continuously fall from the tree. Many people remove the lower limbs of a magnolia tree to facilitate mowing, but if you leave the lower limbs on the tree they will drape to the ground, hiding the fallen leaves. The shade from the tree and accumulation of leaves prevents grass from growing, and as the leaves break down they provide nutrients for the tree. Most magnolia trees are hardy in USDA Zones 7 through 9; however, there are some cultivars that survive winters far north of zone 7. For the most optimal results in how to grow healthy magnolia trees outside the usual growing area, buy your trees locally to make sure the variety is well suited to your region. If you are looking for an ornamental tree that will tolerate wet, soggy soil, you need look no further than a magnolia. 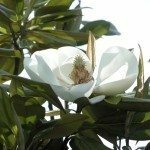 Magnolia planting is best done in a moist, rich, slightly acidic soil that is amended with compost or leaf mold will get the tree off to a good start. As part of your magnolia tree care, you’ll need to water the trees to keep the soil around the base of the tree moist. It is especially important to keep young trees well-watered until they become established. Fertilize in spring when the flower buds begin to swell with a slow-release fertilizer. Additional magnolia info for growing healthy trees involves routine lawn maintenance. Always point lawn mowers so that the debris flies away from the tree, and keep string trimmers at a distance. Magnolia tree bark and wood are easily damaged by flying debris from a lawn mower and by string trimmers. The resulting wounds are entry points for insects and diseases. Pruning is another factor in how to care for a magnolia tree. Wounds heal slowly, so keep pruning to a minimum. Prune the tree to repair damage from broken branches as soon as possible. You should perform all other pruning after the tree flowers.